Note: For those using mobile devices, I’m not sure why some of the pictures are showing upside down. I’m working on fixing it. Thanks for your patience! This week was our first week of planned preschool. We have done lots of preschool activities before this, but this week was the first time I actually planned ahead and picked out activities. And the theme for this week is…”I’m Unique”! I planned on doing the theme “All About Me”, which will include family, friends, and feelings activities, besides the “I’m Unique” concept. There was no way I was fitting that all into one week! So stay tuned! This turned into a play with the cat moment, though. 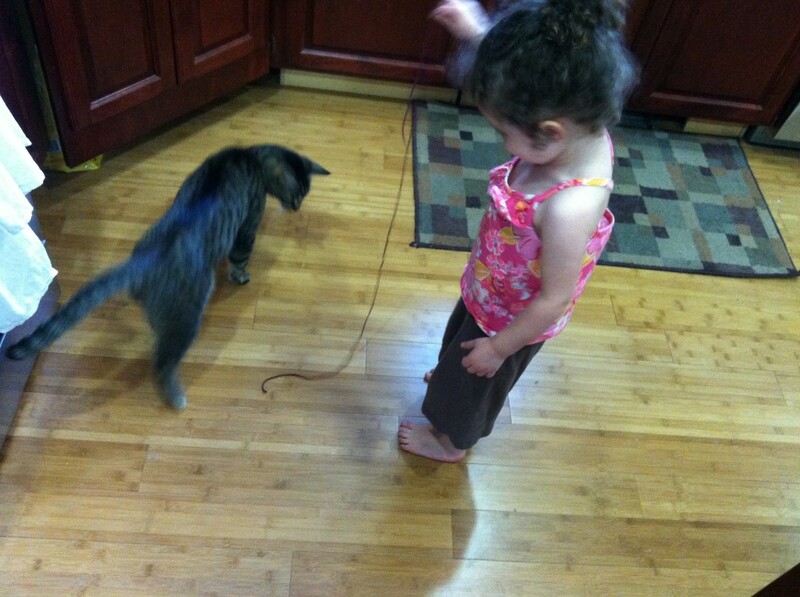 The cat was attacking the wall trying to get the yarn off! And of course, we counted EVERYTHING! I thought it was great that she was so into counting (and I still do, obviously), however it gets old when every activity the family is engaged in must be paused for her to count the bugs! the rocks! people’s toes! etc. I just tell myself maybe she will grow up to like math more than Mommy does; that would be something I definitely want for her. Here is a list of the books I picked up at the library for the theme this week. During and after reading the above books I always tried to initiate conversation about how people are different, have different personalities, and how that is a wonderful thing! She really didn’t seem to need convincing on this point; I got the impression her feelings on the matter were something like, “Duh, Mom. Let’s move on!” Move on we did. For literacy activities, I’ve been focusing on her being able to recognize the letters in her name. So I brought out our ABC stamp set and had her stamp with the letters of her name. This is a good fine motor skill activity too! 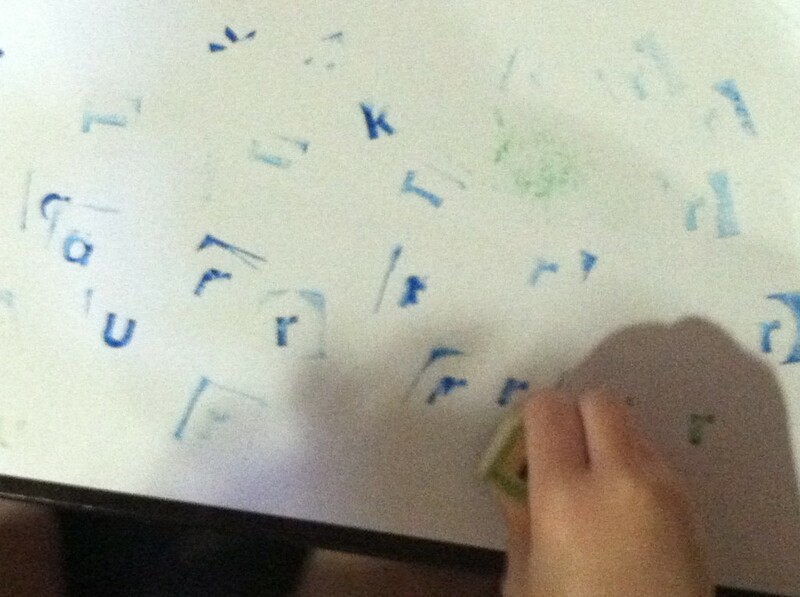 She is also fond of tracing letters with her fingers, so we did that whenever we encountered one big enough to do so. 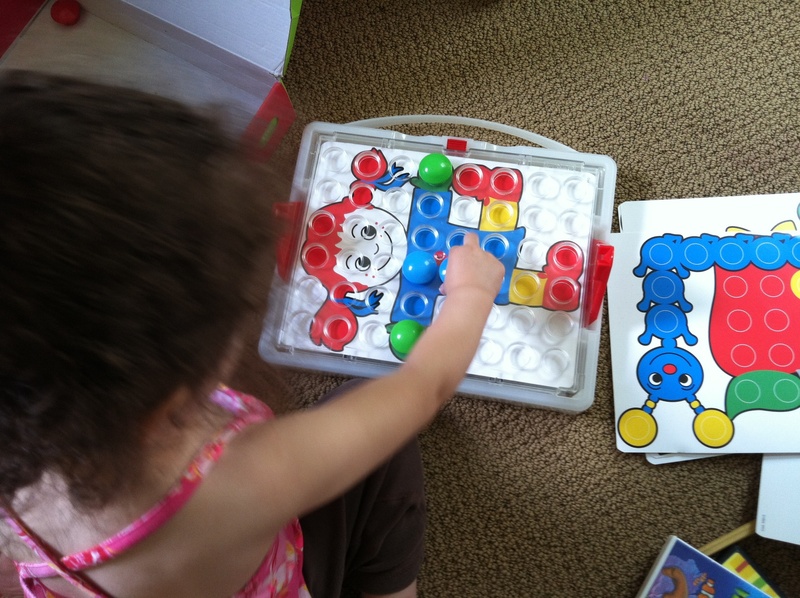 Speaking of fine motor skill activities, she also requested we play with her Fantacolor Junior Pegboard Set . We’ve had this set for awhile. I was afraid she would grow tired of it in a week or two, but she still asks to play with it after several months of owning it. It’s a pegboard set that comes with pictures. You place the pictures underneath the pegboard, and match the colored pegs to the picture. 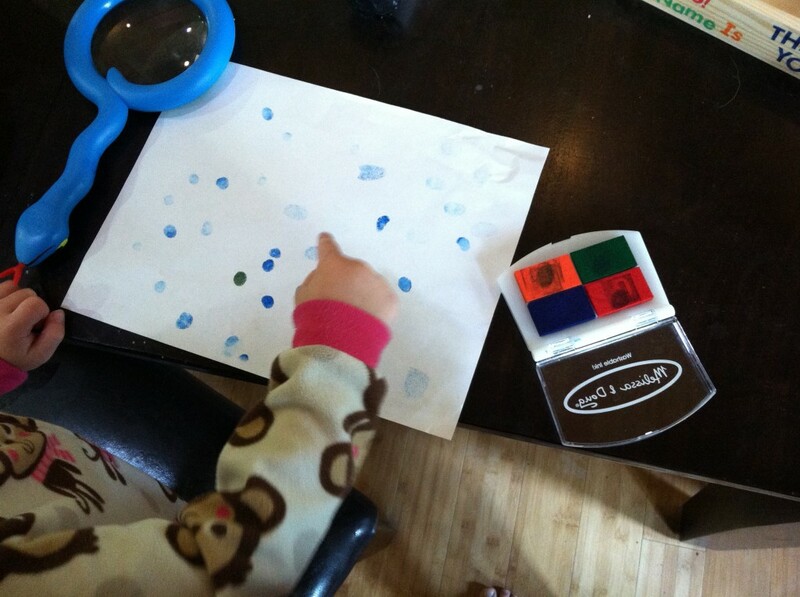 It’s great for learning colors and for practicing those all so important fine motor skills! On the flip side of the cards, it’s the same picture but with no color, so they can use their creativity and make it look how they want. It’s a great educational toy! For science we played around a lot with her new magnifying glass and binoculars . She inspected flowers and bugs and had a grand old time. 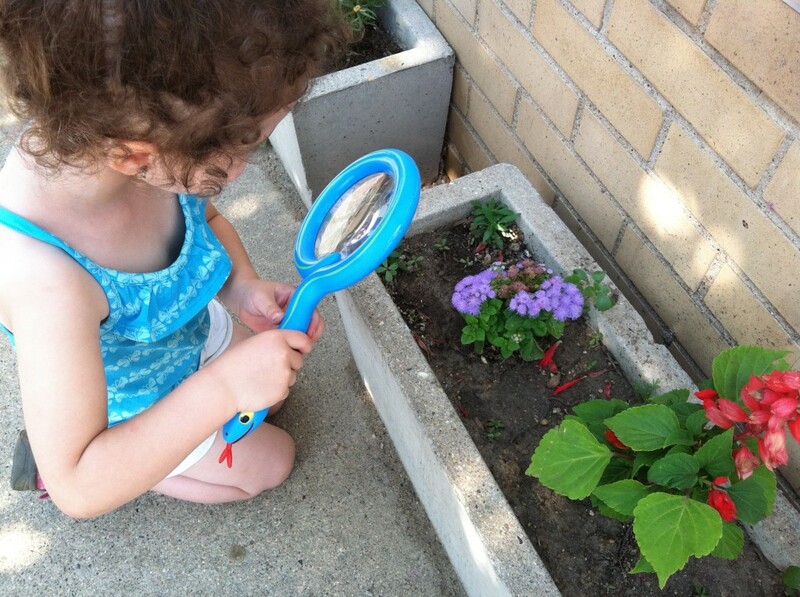 We also did fingerprints and inspected them with the magnifying glass. We talked about how everyone has different fingerprints and how fingerprints help our fingers grip to pick things up. For a “I’m Unique” snack we made faces on crackers and talked about how everyone has a different face. 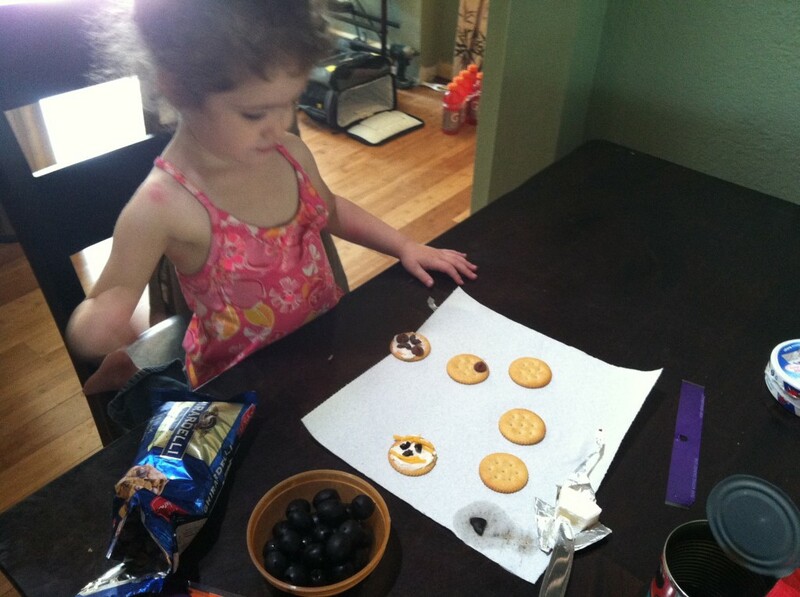 I provided a cheese spread, shredded cheese, olives, chocolate chips and raisins to make the faces. Curly participated enthusiastically in this one. For an art project we did self portraits. First I had her look in a mirror and tell me what color her hair and eyes are, and picked out colors accordingly. I pre-drew an oval shape on the art paper first so she had a starting point. After that, it was all her, as you can see from the pictures below. I participated in this one and did my own self portrait, but there’s no way I’m posting a picture of that- I’m no artist, and I’m especially bad with paint!! I made sure to provide all sorts of brushes, and had the mirror in front of her so she had a quick point of reference. She didn’t use it however. 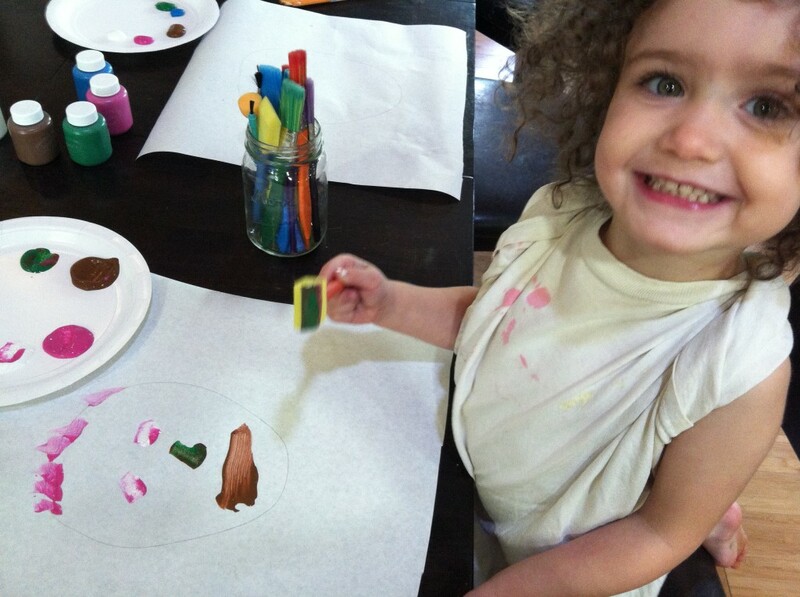 She immediately painted herself with pink hair, a green nose, pink eyes, and brown lips. The finished product. 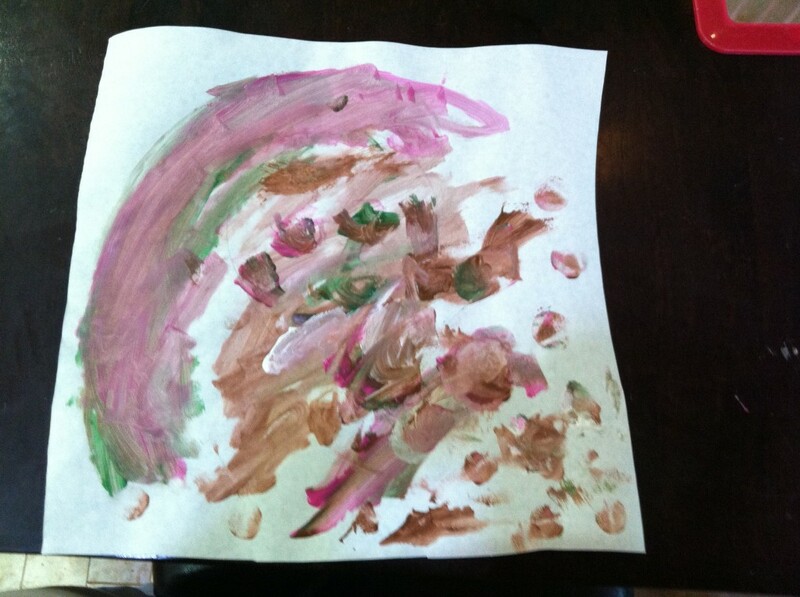 Obviously, my child is much more drawn to abstract art than realism! Overall, we had a fun week! My goal was one or two activities a day, which proved to be a reasonable goal. I had so many more activities we could have done, especially to go along with the books I had picked out! But I am happy that neither Curly or I felt overwhelmed and had fun! We also did things that I didn’t include in this post, specifically because it was things we do all the time and didn’t really relate to the theme. Coloring, tracing, singing, imagining etc. Hope you all had a great week as well! Here are this week’s winners from the library! The Gruffalo by Julia Donaldson is a well known book that for some reason we haven’t read until now. The one week we had it we read it almost every day. This book is a fun one to use different voices for all the characters (mouse, fox, owl, snake, gruffalo), which is perhaps why it was such a favorite for us. This is a story about a clever mouse who gets out of being eaten by other animals by telling them that he’s friends with the gruffalo, which he believes doesn’t exist. Until of course, he meets the gruffalo! How he manages to get out of that situation is amusing. This is one we actually have, but Curly didn’t notice it until this week. Harry hates taking a bath so much, he goes and hides the tub scrub brush. Then he goes off and plays, and comes home very dirty. He’s so dirty his family doesn’t know it’s him! He decides baths are good after all, by the end. Apple Pie ABC by Alison Murray is a fun ABC book. You can guess the premise – A, apple pie, B, bakes it, C cools it, etc. But it gets more interesting as it goes along. The dog really wants the pie. His antics to get at the pie are humorous, so it tells a story alongside teaching the ABC’s. Press Here by Herve’ Tullet is the favorite of the week, even over Gruffalo! This is one of those rare books Curly wanted read again as soon as it was done. It’s an interactive book. It starts off with a yellow dot, and it asks the reader to push the dot. More dots appear. Rub the dots, the dots turn color. Shake the book, and the dots scatter, etc. This book is actually a good one for fine motor skills, and also for learning words like ‘gently’ and right/left. This book also involves learning colors (touch the blue dot) and counting (tap the yellow dot 5 times). I was very impressed and Curly was entertained! Winner!! One of our favorite activities lately is cutting practice. 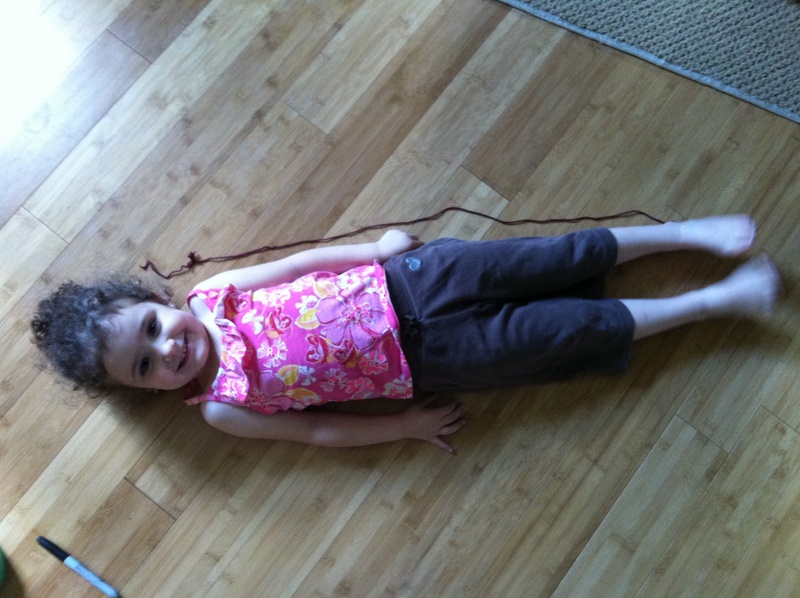 I usually give her a piece of paper that she’s scribbled on, and then draw lines on it for her cut. She loves it, and I really love it for one particular reason – it keeps her busy. For a looong time. 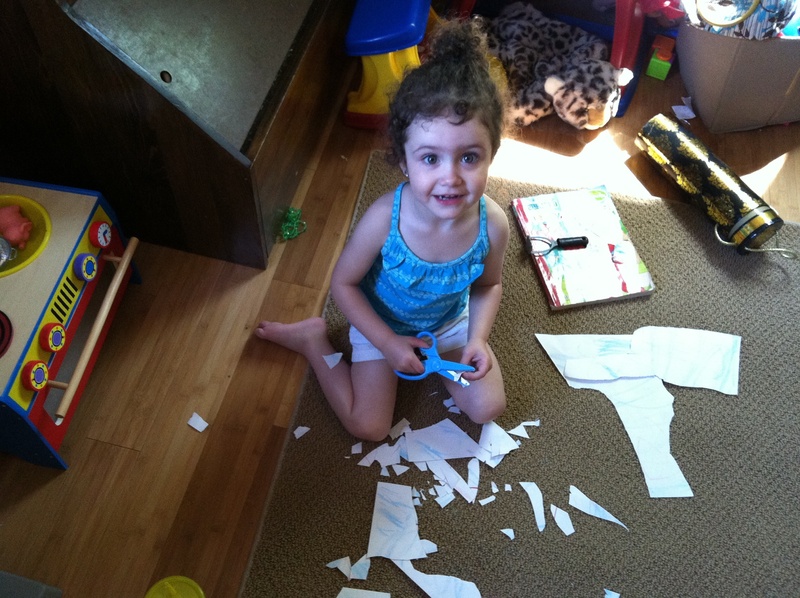 She brings me random shapes she cut out, shouting things like ‘Mom! I made a porcupine!’ or “Look!! a teapot!” She then cuts it all up into teeny tiny pieces. By the time she’s done, she has a huge pile of confetti. We then collect it all into baggies and keep it for the next project. You can guess what we do with all those teeny tiny scraps of paper. We glue them onto another piece of paper, a paper plate, or something similar. She usually has an idea of what she wants to make. Lately rockets have been the favorite. If the pieces are extra small, I have her sprinkle them onto the glue already on the paper, rather than glue each individual piece. At the end, you have a mosaic! Then, we wash glue off fingers and vacuum any remaining confetti off the floor. Ta Da!